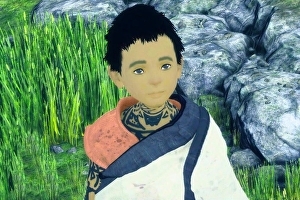 Can we talk about the ending of The Last Guardian? Fumito Ueda’s games all end in a similar manner. Each ones concludes on an ambiguous, vaguely melancholy note before fading away to credits, only to be revisited with a more optimistic post-credits epilogue. A wind-scoured castle, crumbling into a sun-bleached sea. A towering shrine, rising above a landscape of decaying ruins and moss-skinned rocks. An isolated tower surrounded by vast chasms, speckled with high-arched walkways and overgrown ledges. Though the games of Fumito Ueda may depict delicate relationships, vast beasts and impregnable mysteries, it has always been their distinctive architectural spaces that gave them a concrete form. Ever since Ico’s castle hazily emerged from the bloom and mist on the games title screen in 2001, these monolithic structures have become symbols for the sense of scale, mysticism and artistry that have made Ueda’s games instantly recognisable and widely loved. With The Last Guardian, Ueda and his team at Gen Design and Sony’s Japan Studios have once more returned to the ageing stones and high arches of their singular world. Like Ico, the game isolates the player in a vast empty megastructure, tasking them with finding their way through its labyrinthine halls. It’s a structure than many games have shared, from the original Metroid through Prince of Persia: The Sands of Time all the way up to this year’s Dark Souls 3. However, despite this familiar rhythm of puzzles and vistas, there is something distinct about The Last Guardian’s architecture. It’s not something that’s easy to put your finger on: there’s a strangeness to the heavy blocks, angular buttresses and gridded stonework that isn’t instantly recognisable from real life. There’s an Aztec feel to the geometric patterning that surrounds The Last Guardian’s gates and archways, but it lacks the animal imagery and the stepped forms that make images of ancient cities like Teotihuacan so memorable. There’s also something of the ancient architecture of Rajasthan too – in the balconies enclosed by ornate arches and the pillars overflowing with ornamentation – but again, The Last Guardian builds these structures out of simple, ambiguous forms not the strong religious and pictorial details of, say, the Dilwara temples. There are hints of each of these styles, and many more, in Ueda’s world, but none seems to fit, each one remaining distantly related. 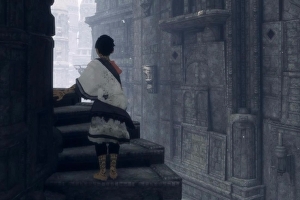 The Last Guardian’s real world references remain a mystery then, but there are clues in the Ueda’s previous games that begin to explain why that is. This week, with the arrival of The Last Guardian, directed by Fumito Ueda, we journey back to 2001 to revisit the classic Ico for PlayStation 2 – the first Ueda classic. John Linneman is your guide as Digital Foundry assesses Ico’s beautiful technology, charting its journey from the original PlayStation across to PS2, as well as covering Bluepoint’s excellent last-gen remaster. 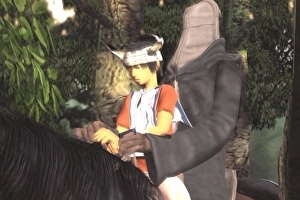 As usual, there’s plenty of behind-the-scenes footage and rare curios – if you want to see Ico running on original PS2 hardware at 60 frames per second (double its usual output), along with a host of debug options, John’s got you covered. This instalment of DF Retro is our penultimate episode this year – we’ll be rounding off 2016’s offerings next week by completing the Ueda Collection with an in-depth analysis of Shadow of the Colossus. The Last Guardian is out at last. After the release of Ico in 2001 and Shadow of the Colossus four years later, it’s fair to say Team Ico’s third game has had the most troubled development of them all. When it began as a PS3 title in 2007, nobody could have anticipated a nine year wait to see the title on store shelves. But on its own terms the result is breathtaking; despite the age of its concept – and many of its assets – The Last Guardian’s backdrops still wow due to on-point art direction from director Fumito Ueda. The story behind its technology however, from a leaked target render in 2009, to its eventual release in 2016, plays a big part in explaining how the final game turned out. 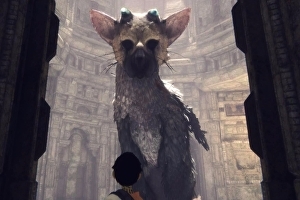 While it may have been announced in 2007, our first actual sighting of The Last Guardian came in 2008, through a . One image was released next to it: the mysterious motif of a chain leading into the ground. Actual video of the title surfaced in mid-2009. A trailer leaked by playstationlifestyle.net, revealed a target render used by the developer, likely from a period earlier in development. It was an internal demo with a working title of Project Trico – a blueprint, much like Killzone 2’s infamous first reveal, that Team Ico would strive to recreate using actual PS3 hardware. It showed the basic visual concept behind an eventual PS3 title, an almost CG-like presentation at points, though with some very obvious limitations. Character shadows were missing and aliasing was prevalent, and while much of its content would appear in later media, some environments would be completely cut from later trailers. Even so, you could see the same rendering techniques used in Shadow of the Colossus translating directly to this new engine. 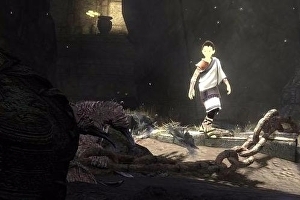 Particularly the ruined, Aztec-style architecture, the faux HDR lighting, motion blur, depth of field, and physics-based elements on chains, and even body ragdolls. It was all there, and very much in standing with the team’s previous hit. This render serves as a fascinating mid-point between Team Ico’s work on Shadow of the Colossus and a true PS3 engine we’d get to see just a few months later. 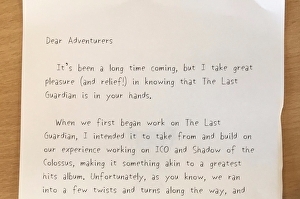 Fumito Ueda has penned a heartfelt message to The Last Guardian players, which Sony has bundled with the game’s media kit. 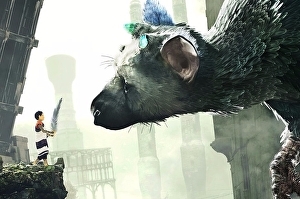 The message, republished below, references the development turmoil that saw The Last Guardian move from a PlayStation 3 game onto PS4. Ico and Shadow of the Colossus director Fumito Ueda’s long anticipated third directorial outing, The Last Guardian, has finally gone gold. First shortly before its , The Last Guardian has had one of the most storied and troubled developments of any game in recent history.